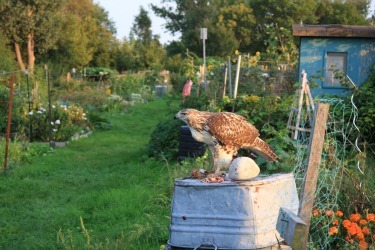 Hi, here are a couple of photos of this gorgeous Hawk sitting 4 feet away from us in the allotment gardens at Leslie Spit, Toronto. 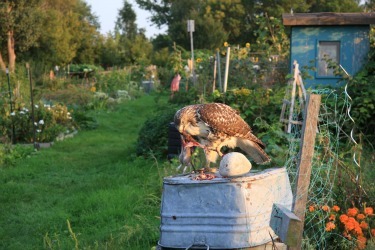 The Hawk was eating it's dinner while sitting on the wash basin on top of the composter. It was really a rare sight to see. We were certainly in the right place at the right time. Unbelievable. Thank you for sending your wonderful pictures - I'm sure our readers will enjoy them. 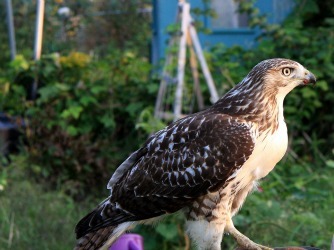 If anyone can identify this hawk, please let us know! Hello Michael, what a great sight this must have been for you. I live in a area with a lot of pigeons around and don't live too far away from the Leslie spit. 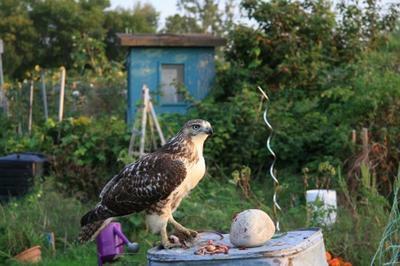 What you had seen was a Red Tailed Hawk. I see them quite frequently and they love pigeons, squirrels and sometimes even Seagulls.